Elegant Scandinavian: Baltic Brown Granite Dark Cabinets Backsplash Ideas. By having dark cabinets and Baltic Brown in your kitchen remodeling, backsplash selection would be a piece of cake and on the other hand, there is no doubt to catch the elegant looking. The writing pattern is the same for my previous readers: First the material and the characteristics of the backsplash then, the color and stain of the dark cabinets will be defined under each picture. Ausrine Beauty: Baltic Brown Granite Countertop article has a chance to look up for other kitchen remodeling ideas. The backsplash colors for Baltic Brown Granite Dark Cabinets Backsplash Ideas can be grayish blue to give enough contrast, beige, natural tones and Baltic Brown herself. The material for the backsplash can be ceramic, tumbled marble, tumbled limestone,glass and granite. The type of the backsplash tile would be subway, square and mosaic and full high backsplash. 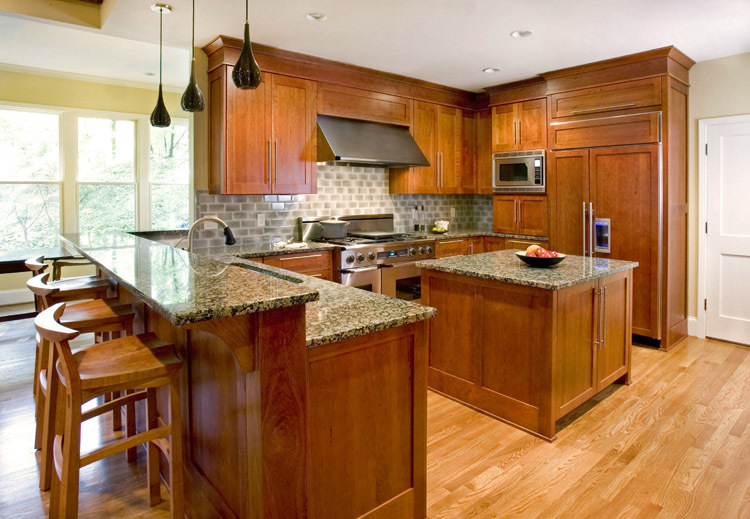 Let me share my favorites of the Baltic Brown Granite Dark Cabinet Backsplash Ideas. Picture Credit: RJK Construction Inc., Stainless Steel Appliance with Cinnamon Glazed Cherry Cabinets and Skylight Glossy /Matte Blend Glass Mosaic Beige Melange Tiles, Porcelain flooring are dancing with Baltic Brown Countertop. Picture Credit:Archer & Buchanan Architecture Ltd., Baltic Brown Granite Countertop and Island top never have been defined like this. Predominant focal point of this image is prussian blue family of cabinet colors with antique stain on hickory and gray glazed subway tiles. No stain light oak flooring coordinates amazingly with this traditional design. Mind blowing and splendid. ( I still look up the name of the backsplash) . Picture Credit: LG DESIGN STONE via Houzz.,Baltic Brown Granite is used as full high backsplash, countertop and island top. Multifunctional stone with dark cherry cabinets , very well done job! Picture Credit :Cameo Kitchens, Inc.., Baltic Brown Countertop and Island top pop perfectly in this kitchen by having Sunset stained Cherry Cabinets, Sylvester Beige Tumbled Marble Square Backsplash, light color travertine diagonal set up flooring and stainless steel appliance. Diagonal set up flooring gives extra enlargement to the kitchen. Picture Credit: Karry Home Solutions., Antique glazed green paint maple cabinets and baltic brown countertop and island top and mosaic mesh-mounted Palladiana Travertine Desert Beige Limestone backsplash. Transitional design is shown very clear. Please be cooperative by dropping comment about Baltic Brown Granite Dark Cabinets Backsplash Ideas. Thank you for your time.